Scrub the oysters in the shell under running cold water. Open carefully with a knife by cutting the oyster at the muscle to separate. Clean. Melt the butter and stir in the spinach, scallions, parsley, celery, breadcrumbs, Tabasco and Pernod. Cook, stirring constantly, until it is soft (10-15 min. ).Press through a sieve or put in a blender. Cool. Place a spoonful on top of each oyster. Broil under 450º heat until the sauce begins to brown (about 5 min.). The oysters sit on a bed of rock salt. 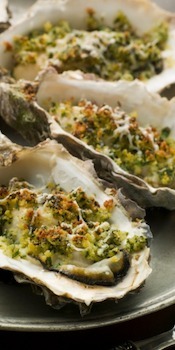 If you prefer more sauce double the sauce ingredients or ½ the amount of oysters.